I’ve been struggling to put into words the emotions that are swirling inside me this week. Everyone has been asking me the same question. How does it feel to see the Cubs in the World Series? After pondering it a few days, I’ve come to the conclusion that the feeling is not really a communal one. It’s a deeply personal one, and it’s different for every life long Cubs fan. My family moved to Germany in 1974 and didn’t return until 1980, but during those years I bought the Stars & Stripes newspaper and continued to follow the Cubs via box scores. I tried to imagine what was going on in my beloved Chicago and my beloved Wrigley Field through the statistics in the paper. Bill Madlock was leading the league in hitting! Rick Reuschel just won his 20th game! 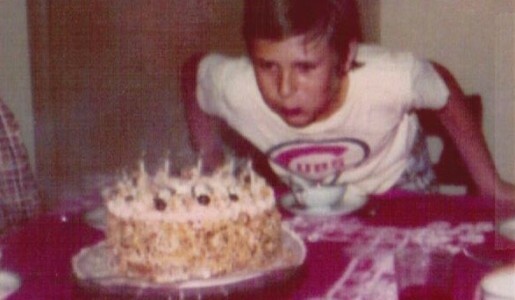 When I turned 12, I wanted a Cubs shirt but they were simply not available in Germany, so my mom and I made one out of a plain white t-shirt. I had two of them. One had #1 for Jose. The other had #26 for Billy Williams. 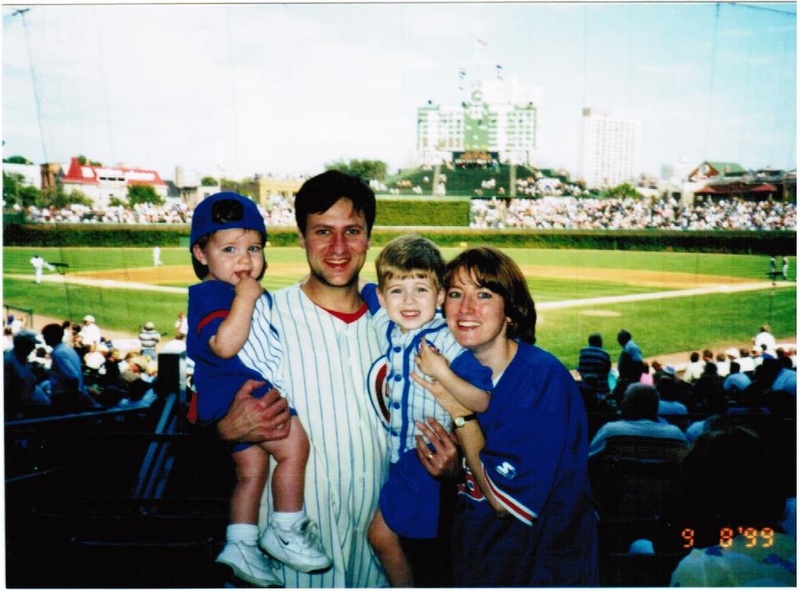 When we moved back to Chicago from Germany, I hopped right back on the Cubs bandwagon. When Uncle Manny came to town we went to the games together. In those pre-1984 days, it was still possible to get our right field bleacher seats. I was in college in 1984. That was a magical season for the Cubs. I made the pilgrimage from Champaign to Chicago for opening day that year. I was covering the game for WPGU Radio and I never felt more like a big shot. I talked to Harry Caray on the field. He predicted a Cubs championship that day, and everyone in the press laughed out loud. Not me. I believed it. And I believed it even more when the Cubs pounded the Mets rookie phenom Dwight Gooden. I also made a life-long friend that day. My companion on that trip was Dane Placko. 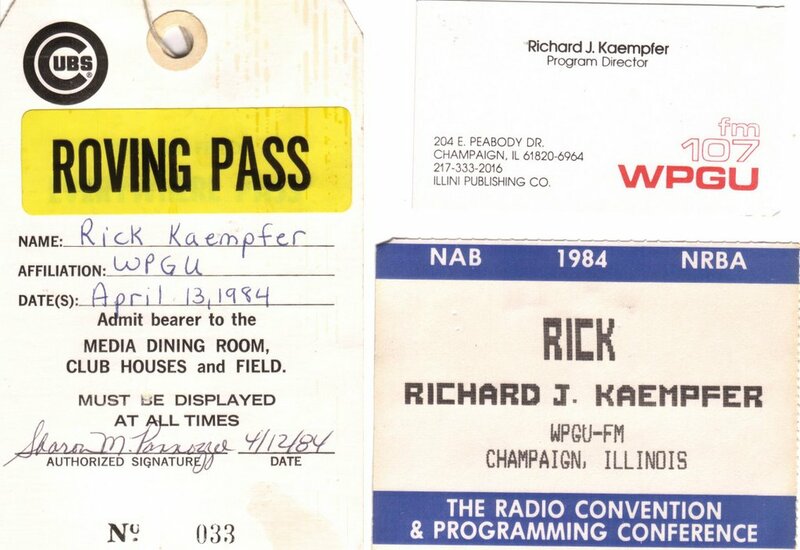 He was the guy who scored us the press passes, and our Cubbie bond exists to this day. We share our season ticket plan. My Cubs innocence, however, was lost in October of that year. I was part of an impromptu parade down Green Street in Champaign when the Cubs clinched the division. I skipped class to watch Game 1 and Game 2 at Wrigley Field. But I also was watching the moment that Steve Garvey hit that home run in Game 4. It’s a moment that is etched in my memory banks forever. As Steve Garvey was rounding the bases, my Sox fan friends Stu and Dave high-fived each other over my head. It’s a story I chronicled in the book “Cubbie Blues: 100 Years of Waiting Until Next Year“, if you want a more graphic description of it. It changed me as a Cubs fan. I began to expect the worst, and I got exactly what I expected in 1989. In 2003, I left game 7 of the NLCS before it ended–because I could smell the defeat approaching. 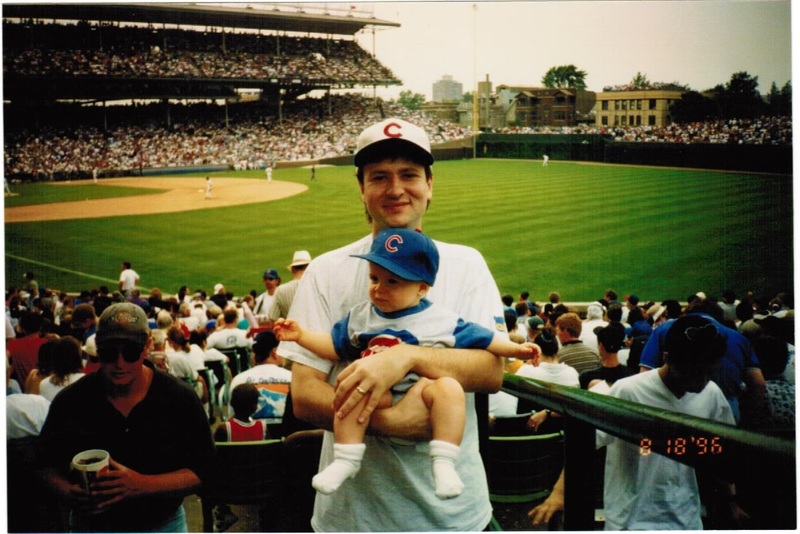 Nevertheless, in 1995, when my first son Tommy was born, I began to mold him into a Cubs fan. When Johnny arrived a few years later, he was also indoctrinated. My goal was to create a Cubs-bond with them that would equal mine with Uncle Manny. Even though neither Tommy nor Johnny became a die-hard fan, I still probably had my favorite day ever as a father with each of them (individually). Tommy and I saw the Paul McCartney concert at Wrigley together in 2011, and it was an emotional moment for both of us. 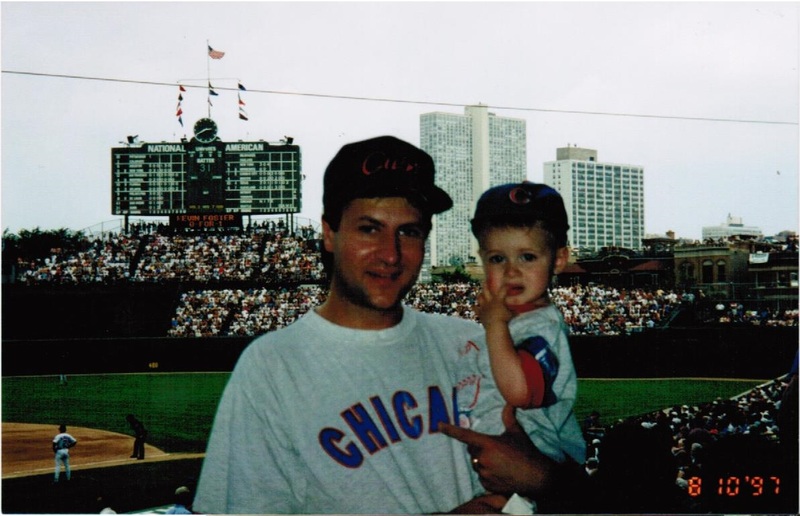 (It’s featured in the book “Father Knows Nothing“) Johnny and I had this great day at Wrigley Field together. When son #3 Sean came along, he somehow naturally became a Cubs fan without my pushing him. We’ve been to dozens of games together over the years (including this absolutely perfect day), and I don’t think I can even begin to explain how much these days meant to me. His Cubs love really kicked in during the 2008 season. And then when the Cubs blew it again, I hit my lowest point as a Cubs fan. The following season I took out an ad in the newspaper, sarcastically announcing the birth of “Waitle Nex Year” on the day I felt the Cubs were officially out of it. It somehow went viral when Deadspin wrote about it. Mary Schmich interviewed me for her Tribune column. I saw the Kerry Wood 20 strikeout game. I set the best chapter of my novel “$everance” at Wrigley Field. I went on the field with Sean during family day. I wrote about Every Cubs Player Ever. But there was also a sad day during this time, and it brings me back to the first thing I thought about when the Cubs clinched their spot in the World Series. At the time, the Cubs rebuild looked like a pipe dream. He lived 69 years and never saw his favorite team in the World Series. Our favorite team. So, when I say this Cubs World Series is not really a communal experience, that’s what I mean. To every one of us it’s a very personal moment. Wrigley Field will be filled with over 40,000 fellow Cub fans who are all experiencing their personal moments together. Millions more (including me) will be watching it on television or listening to it on the radio. I’ll enjoy seeing this incredible bunch of players ending that long drought. I’ll cheer when they score, and I’ll be there in the moment–win or lose. But I’ll also be looking skyward and raising a toast to Uncle Manny, and all the other wonderful people who never got to see this day. Sorry for the long-winded response to your question, but that’s what a Cubs World Series means to me.